Queen Elizabeth 2 Headed For Chinese Scrap Yard? The UK’s Daily Mail reported last night that a Chinese crew of 20 had boarded the ship in Dubai– replacing a crew of 40 who had been maintaining the vessel – leading to fears that the ship has indeed been sold for scrap. 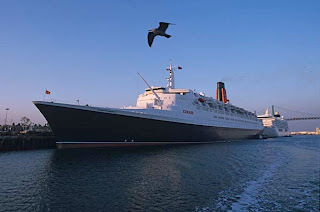 The Daily Telegraph reported this morning that QE2 is reportedly to be sold for scrap to a Chinese firm after plans to turn it into a floating hotel were abandoned. The former Cunard liner has been moored in Dubai’s Port Rashid since it was sold to the firm Istithmar in 2008. Keith Hamilton from Southampton’s Daily Echo lead with, “Fears grow that legendary liner QE2 could go to the breaker’s yard”. Rob Lightbody from the QE2 story http://www.theqe2story.com has been warning for months that negotiations for a scrap deal appeared to be underway. Has time run out for this famous and beloved ship? Background: Dubai had originally planned to convert the QE2 into a 1,000 room luxury hotel at the Palm Jumeirah island. After the emirate was hit hard by the credit global crunch and the ship has since remained at Port Rashid. Earlier this month, a British consortium presented Dubai with a $113m (£70m) bid to bring QUEEN ELIZABETH 2 to London and convert into a five star hotel berthed near the O2 Arena on the River Thames. The QE2 London bid was support of Chancellor of the Exchequer, George Osborne and London Mayor, Boris Johnson likely could have brought about 2,000 new jobs to London.